The family-friendly quarterly event began in summer 2014 with a performance at Agnes Scott College before expanding to locations around Atlanta such as Variety Playhouse, Switchyards Downtown, and the Plaza Theatre. To grow the audience further, Bakers started a Good Gracious podcast after the fourth live variety show. The podcast features live musical performances recorded at Wondershop, Baker’s studio in Candler Park, along with conversations with civic leaders, authors, and more. 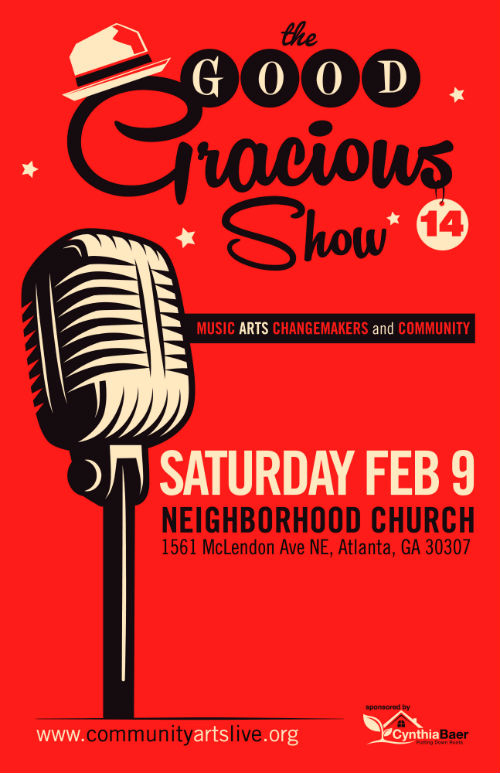 The line-up for the Saturday evening show at Candler Park’s Neighborhood Church features a host of local talent: the Good Graces, improvers from Dad’s Garage, singer-songwriter Robbie Horlick, the Squirrel Census (a favorite, Baker says), the Real Ukuladies of Atlanta, and storyteller Billy Hall. See it: Tickets for the 8 p.m., Saturday, February 9 show at Neighborhood Church are $15 for adults, $10 for kids, and can be purchased here.